Need a change from the usual BBQ fare? Get ready to whip up some delicious, easy, healthy summer recipes that will thrill your whole family! These 5 recipes will take your BBQ season to a whole new level…without taking your cholesterol and waist band to new levels as well. The recipes are perfect as is for a family of 4, or just double everything to turn them into recipes for large families (or if you want to have some leftovers!). 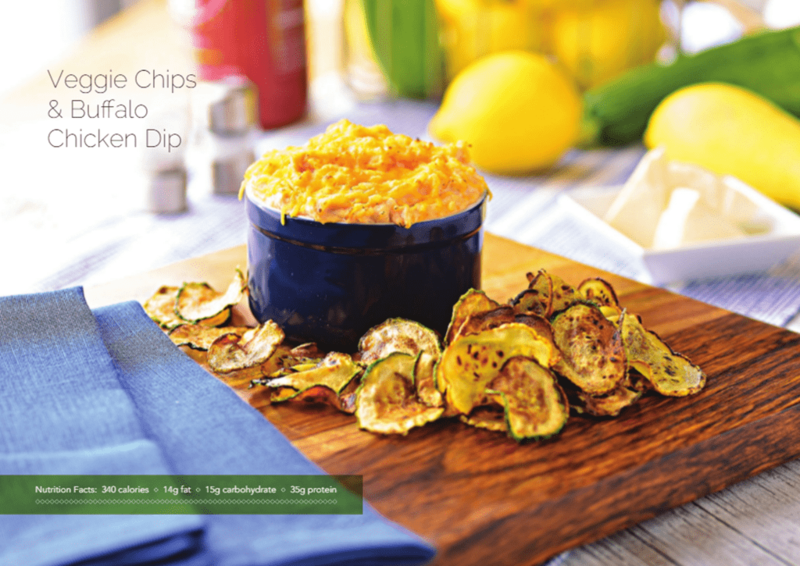 All of these recipes and more are found in the Simply Well™: An Everyday, Healthy Cookbook. Let’s check them out! Do you have any favorite healthy summer recipes that you love to make for your family? Tell us about them in the comments! 1. Preheat broiler on low. Remove stems, and gently scrape out the gills from the underside of the mushroom cap and discard. Rub olive oil onto mushrooms and place on a baking sheet. Broil until tender, about 4 to 5 minutes. 2. Meanwhile, cook beef with onion, pepper, and garlic in a large skillet until brown over medium-high heat. Reduce heat, add tomatoes and spices, and simmer for 10 minutes. 3. Divide the mixture into four portions, and then scoop one portion into each mushroom cap (serve any excess filling alongside the mushroom). 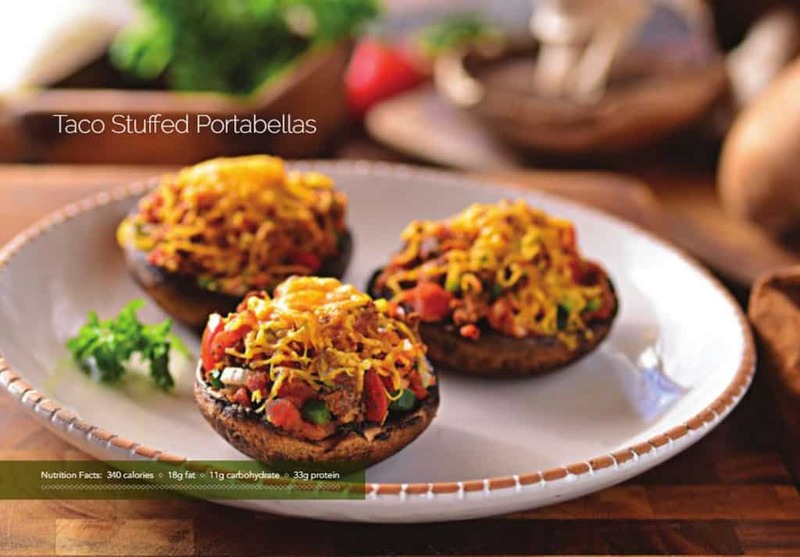 Sprinkle one ounce of cheese on top of each mushroom. 1. Preheat your oven to 425˚ F.
2. Place cauliflower florets in a food processor and pulse until they become very fine rice-like pieces. 3. Place cauliflower “rice” in a microwave-safe bowl, and cook for 7 to 8 minutes stopping midway to stir. 4. Once cooled, transfer the “rice” to a cheesecloth or clean, thin dishtowel, and squeeze out as much liquid as possible. 5. In a large bowl, combine “rice,” egg, mozzarella, and oregano, until thoroughly mixed. Press the mixture out into the shape of a pizza crust, about 1∕3-inch to ½-inch thick (make sure the crust isn’t too thin), onto a baking sheet lined with parchment paper. Bake for 15 to 20 minutes, until crust is firm, and light brown. 6. Meanwhile, combine ranch dressing mix, Greek yogurt, cream cheese, and scallions. Cook turkey bacon according to package directions, and chop into small pieces. 7. Once crust is cooled, spread ranch mixture evenly onto crust. Top with half of the cheese, chicken, remaining cheese, and bacon. Cook an additional 5 to 7 minutes, until cheese is melted and crust is golden brown. Top with lettuce and tomatoes. Love this recipe? 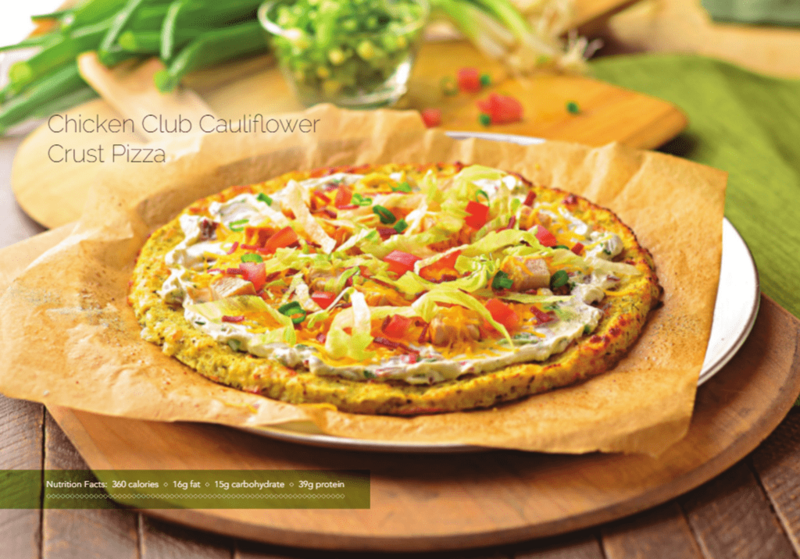 Check out more delicious ways to cook with cauliflower this summer! 2. Whisk the olive oil, lemon juice, salt, pepper, and rosemary together in a large mixing bowl. 3. Add yellow squash and zucchini, and gently mix to coat. 4. On a large, lightly-greased baking sheet, arrange yellow squash and zucchini slices in a single layer. 5. Bake for 20 to 30 minutes, until crisp. 6. Meanwhile, mix all dip ingredients until smooth, and transfer dip mixture to a small, lightly-greased baking dish. 7. Once chips are removed from the oven, add dip mixture and bake for 15 to 20 minutes, until lightly browned, hot and bubbling. 1. Sauté the diced jalapeño in a lightly greased skillet until tender. 2. Mix the jalapeño, chicken, avocado, yogurt, one cup of cheese, and chili powder in a medium bowl. 3. 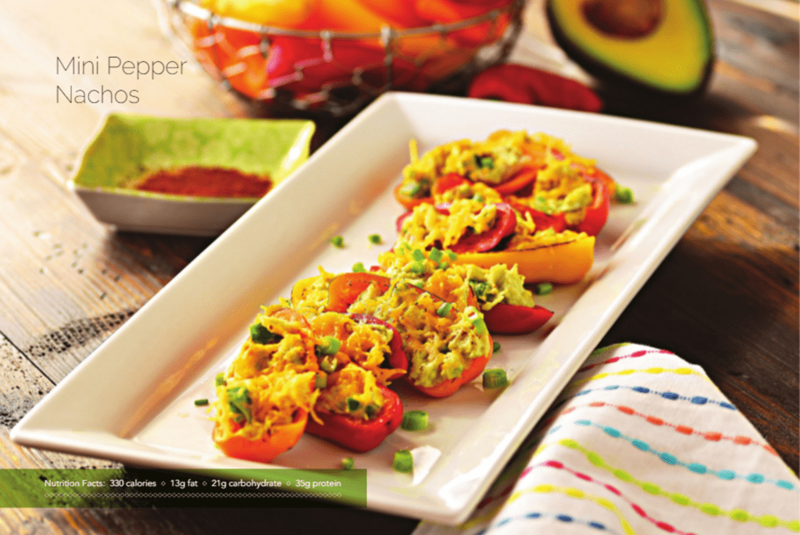 Arrange the mini bell peppers in a single layer in a large casserole dish. Fill with chicken mixture, sprinkle with remaining cheese, and broil until cheese has melted, about 2 to 4 minutes. 4. Garnish with scallions and serve with salsa, if desired. 1. Place shrimp and blackened seasoning mix in a re-sealable plastic bag (you may need to divide shrimp into two batches). Shake contents of the bag to distribute seasoning evenly. 2. Heat two teaspoons of olive oil in large-skillet, and add half of the shrimp in a single layer. Cook about 2 to 3 minutes per side, until shrimp are pink and cooked through. Repeat with remaining olive oil and shrimp. 3. For the avocado crema: Combine Greek yogurt, avocado, and one tablespoon of lime juice in blender or food processor. Blend until smooth. 4. For the tomato salsa: Stir the tomatoes, green bell pepper, onion, cilantro, jalapeño pepper, and remaining tablespoon of lime juice in a medium bowl. 5. 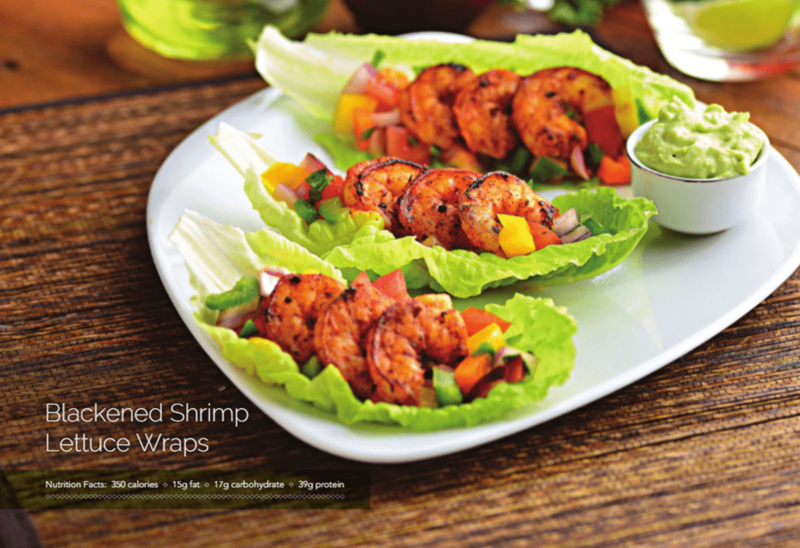 Prepare lettuce wraps by dividing the shrimp, avocado crema, and tomato salsa evenly among the lettuce leaves. Serve immediately. Don’t they all look amazing? My favorite is the buffalo chicken dip. That stuff is SO good! I’m looking forward to trying some of the others this summer too. Thanks for sharing i love preparing new recipes for my family and i cant wait to surprise them with this dish ! and will be trying it very soon but love all of these great ideas. I am just loving all of them, such delicious & healthy foods that will go well anyone around. 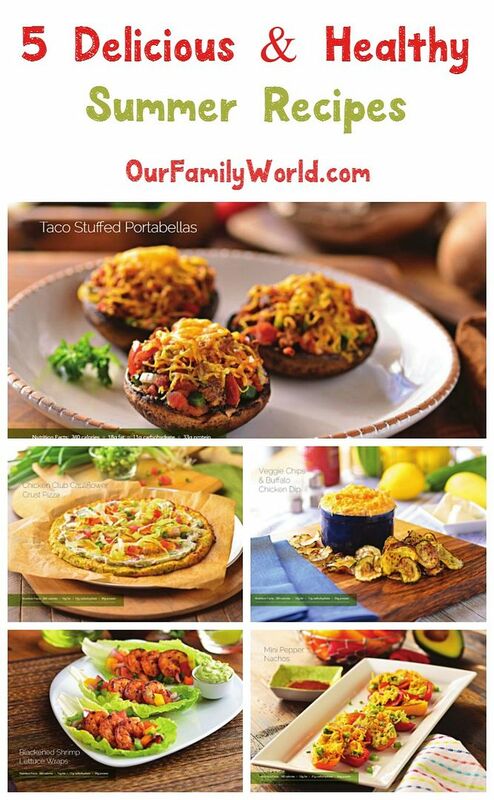 The Taco Stuffed Portabellas & those Blackened Shrimp Lettuce Wraps are just amazing that I would love to try them at home. Yummm… Everything looks so good!! I would love to try all these recipes. Thanks for sharing! My family and I always need new recipes. We get burnt out on the usual summer recipes. These recipes look really amazing and kid friendly! Thank you for sharing them!